Melbourne City Councils 'Urban Forestry Fund' chose our project Greening Howlett Street for the first grant of its kind. Read more about the project on Melbourne City Councils Website, the project has also been covered by the ABC. The sunken courtyard is dominated by a Eucalyptus cameldulensis which is well over 100 years old and seems to be a remnant of the original plains woody grassland EVC. To honour the unlikely survival of this beautiful tree the proposal is to create an entirely indigenous planting scheme with no hard landscaping to ensure the roots of the tree are not disturbed in any way. The plantings will be richly diverse greatly adding to the local biodiversity. 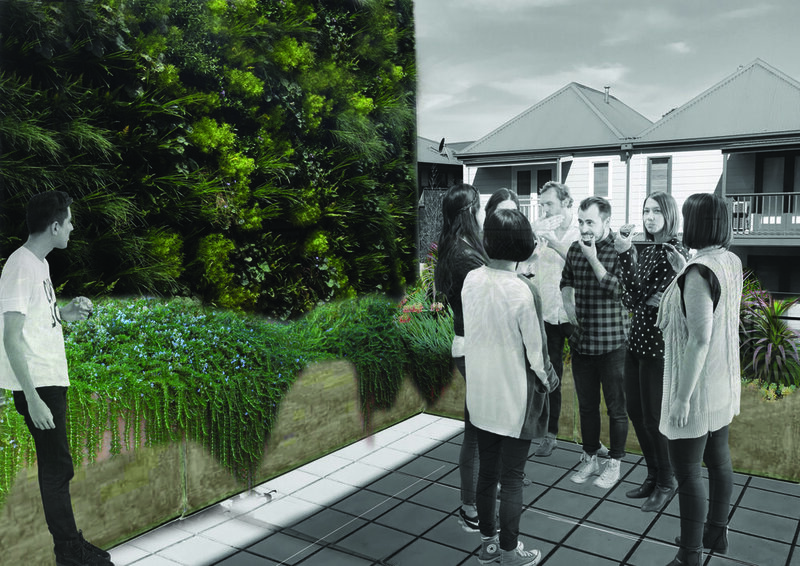 The proposed courtyard would demonstrate great community benefit in multiple ways; the shaded and heavily planted environment would provide a heat refuge for pedestrians travelling along Smithfield road with full public access from the road. The community would also benefit from the provision of seating in the courtyard allowing greater opportunities for interaction building social resilience. Two 3000 litre rain water tanks will allow the space to be irrigated in hot weather and due to the indigenous plant selection, the courtyard will not use any potable water. The strip of land on the west side of the property is on a busy main road that has a lot of truck traffic resulting in diesel pollution. To combat diesel pollution, which has a large particulate size, trees with dense foliage filter the air most effectively. For other pollutants generated from traffic deciduous plants tend to be the most robust due to the annual leaf renewal. Native pines - Callitris rhomboidea,Hackberries - extremely drought tolerant and very good at catching large particulate pollution- Celtis occidentalis – a small drought resistant tree that is deciduous and very good at filtering pollutants, Abelia - Abelia grandifolia – a drought hardy shrub that is dense and good at catching dust and other large particulates and Mattrush - Lomandra – an indestructible native plant that can regenerate after drought and can capture particulates. 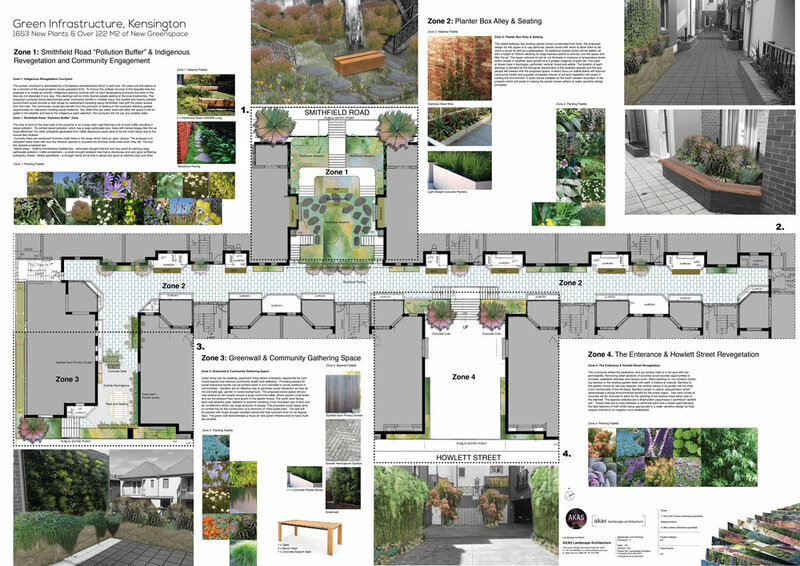 The raised walkway has existing planter boxes constructed from brick, the proposed design for this space is to cap particular planter boxes with wood to allow them to become a social as well as a greenspace. 34 additional planter boxes will be added, all with a height of 700mm allowing for large biomass plants to actively cool the space and filter the air. The larger volumes of soil do not fluctuate in moisture or temperature levels which results in healthier plant growth and a greater longevity of plant life. The planter boxes have 4 typologies; perfumed, vertical, forest and edible. The location of each typology is dictated by the biological requirement of the selected species and the way people will interact with the proposed space. A heavy focus on edible plants will improve community health and a greatly increased volume of soil and vegetation will assist in cooling the environment. 4 tanks will be installed on the south western boundary of the property which will assist in making the planter boxes adhere to water sensitive design principles. Urban living can be isolating, apartment living allows a fantastic opportunity for communal spaces that improve community health and wellbeing. Providing spaces for social interaction bonds can be formed which in turn translate to social resilience in communities. Gardens are an effective way to generate social interaction as they do not preclude age, gender or social background. The proposed social space will provide seating for ten people around a large communal table, where people could share and eat the produce they have grown in the planter boxes. The south west facing brick wall absorbs solar radiation in summer resulting in the increased use of fans and air conditioners which use large amounts of energy. The proposed social space aims to combat this by the construction of a minimum of 10m2 green-wall. The wall will be planted with tough drought resistant plants that look luxuriant even on 40 degree days. The green wall demonstrates a focus on new green infrastructure to have multiple benefits. The concourse where the pedestrian and car access meet is a hot spot with low permeability. Removing small sections of concrete would provide opportunities to increase vegetative biomass and canopy cover. Mass planting on non invasive clumping bamboo in the existing garden beds will reach 3 metres at maturity. Bamboo is the perfect choice for two key reasons; the vertical nature of its growth will not inhibit any functionality of the driveway. Bamboo excels in carbon sequestration which demonstrate a strong environmental benefit for the entire region. Two semi circles of concrete will be removed to allow for the planting of two feature trees either side of the stairwell. The species selected are a Brachyciton populneaus x acerfolium ‘jerildre red’. These trees are a cross between a rainforest plant and a desert plant allowing the best features of both whilst being appropriate to a water sensitive design as they require minimal to no irrigation once established.